The literature on therapeutic relationships in occupational therapy focuses primarily on the development of skills, attitudes, and approaches that practitioners should incorporate into the therapy process. Although evidence suggests that these relationships affect therapeutic outcomes, there is limited information on how they affect and influence the occupational therapy practitioner. This phenomenological study was conducted to elucidate how occupational therapists perceive meaningful therapeutic relationships. The resulting themes include entering into the client's world, forming a connection, maintaining equilibrium, and finding meaning. These preliminary themes were supported by narratives and interviews obtained from six female occupational therapists who worked in pediatric and/or physical rehabilitation settings. Limitations of the study include the use of convenience sampling and the use of multiple novice researchers to complete data collection. The importance of therapeutic relationships has been documented for decades, and attention generally focuses on what the practitioner brings to the relationship (Frank, 1958; Peloquin, 2003; Schwartzberg, 1988; Taylor & Van Puymbroeck, 2013; Walker, 1971). The underlying belief espoused in the profession is that client-practitioner relationships offer a mechanism for recognizing, facilitating, and maximizing the therapeutic process (Doig, Fleming, & Kuipers, 2008; Weinstein, 2013). However, the literature has not addressed how these relationships may reciprocally affect the practitioner. The goal of this phenomenological study was to elucidate how occupational therapy practitioners perceive meaningful therapeutic relationships. For this study, we defined meaningful therapeutic relationships as self-described experiences that the practitioner perceives as personally significant. Therapeutic relationships between practitioners and clients are considered central to occupational therapy practice (American Occupational Therapy Association, 2014; Taylor & Van Puymbroeck, 2013) and instrumental in achieving functional outcomes (Hall, Ferreira, Maher, Latimer, & Ferreira, 2010). Various constructs of the therapeutic relationship posit the practitioner and client engaging in diverse types of interactions influenced by professional knowledge and expertise (Maitra & Erway, 2006), perceived powers of authority (Crepeau & Garren, 2011; Haertl, Behrens, Houtujec, Rue, & Ten Haken, 2009), the personal lived experiences of clients and the value of incorporating them into the therapy process (Cleary, Hunt, Horsfall, & Deacon, 2012; Duff & Bedi, 2010), cultural sensitivity and responsiveness (King, Desmarais, Lindsay, Piérart, & Tétreault, 2015), and imagined professional roles (D'Cruz, Howie, & Lentin, 2016). External contexts that affect therapeutic relationships include restrictions on reimbursement and time devoted to intervention (American Occupational Therapy Association, 2014; Doig et al., 2008), types of practice settings (Palmadottir, 2006), and frames of reference used to support intervention and therapeutic approaches (Crepeau & Garren, 2011; Palmadottir, 2006). The term “therapeutic use of self,” primarily used in the occupational therapy literature to describe an aspect of therapeutic relationships, highlights the role of the practitioner within the therapy process (Holmqvist, Holmefur, & Ivarsson, 2013; Taylor, 2008). The literature on therapeutic relationships and the therapeutic use of self is primarily conceptual and entails the practitioner developing skills and attitudes to form a working therapeutic alliance (Taylor, 2008). Preliminary empirical evidence suggests that there is variance in practitioners' understanding and appreciation of these multidimensional relationships as well as in their level of comfort with engaging in relationships effectively (Taylor, Lee, Kielhofner, & Ketkar, 2009). Clients bring to the occupational therapy process their life experiences and their hopes and dreams for the future. They identify and share their needs and priorities. Occupational therapy practitioners bring their knowledge about how engagement in occupation affects health, well-being, and participation; they use this information, in addition to theoretical perspectives and clinical reasoning, to critically observe, analyze, describe, and interpret human performance. Mutual and collaborative approaches incorporate therapeutic principles, such as using intentional listening (Romanoff & Thompson, 2006) and active listening (Crepeau & Garren, 2011), co-constructing narratives (American Occupational Therapy Association, 2014; Mattingly, 2000; Wicks & Whiteford, 2003), finding common ground (Rosa & Hasselkus, 2005), and integrating spirituality into practice (Egan & Swedersky, 2003; Gockel, 2011; Luboshitzky, 2008). Yerxa (2005) extended another concept beyond mutual exchange in her description of authentic occupational therapy in which the practitioner experiences genuine emotions during reciprocal interactions with the client. For practitioners to enter into such reciprocal interactions, they must be receptive to clients' thoughts and emotions (Yerxa, 2005). Yerxa noted that “the authentic occupational therapist is involved in the process of caring and to care means to be affected just as surely as it means to affect” (Yerxa, 2005, p. 138). Within the occupational therapy literature, it is assumed that therapeutic relationships are important and central to the therapeutic process, that they can affect the outcome of therapy, and that they are influenced by practitioners' personal qualities and dispositions as well as by the approaches used. Although therapeutic relationships are influenced by practitioners' internal contexts, therapeutic environments, and external contexts, there is also an ideal that therapeutic approaches should be mutual and collaborative (American Occupational Therapy Association, 2014). Yerxa (2005) pointed to another level of understanding that these relationships also may have a significant effect on the practitioner. What is missing in the empirical literature is recognition of any reciprocal benefit of therapeutic relationships that practitioners might perceive as significant. In particular, we do not understand how practitioners experience therapeutic relationships and how these relationships influence the practitioner's professional role. In an effort to expand the understanding of therapeutic relationships beyond what the practitioner brings to them to include what practitioners experience through meaningful therapeutic relationships, this pilot study was conducted to elucidate occupational therapists' perspectives. This study used a phenomenological design (Creswell, 2013; Wilding & Whiteford, 2005) to explore practitioners' meaningful therapeutic experiences with clients. 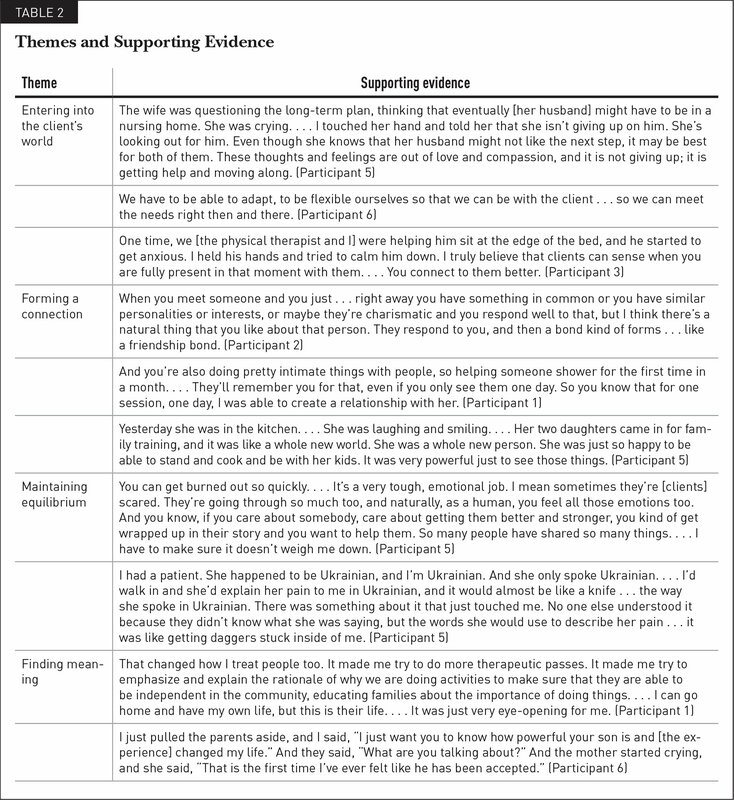 Six female participants who were occupational therapists with 5 to 30 years of clinical practice in pediatric and/or physical rehabilitation settings initially shared personal narratives about such relationships to inform the research process (Table 1). The researchers performed extensive coding and constant comparative analysis of transcripts to identify initial themes and develop probing questions for a second interview with the participants (Saldana, 2009). Additionally, multiple points of member checking and a follow-up e-mail at the end of the study were included to clarify the identified themes with the participants. 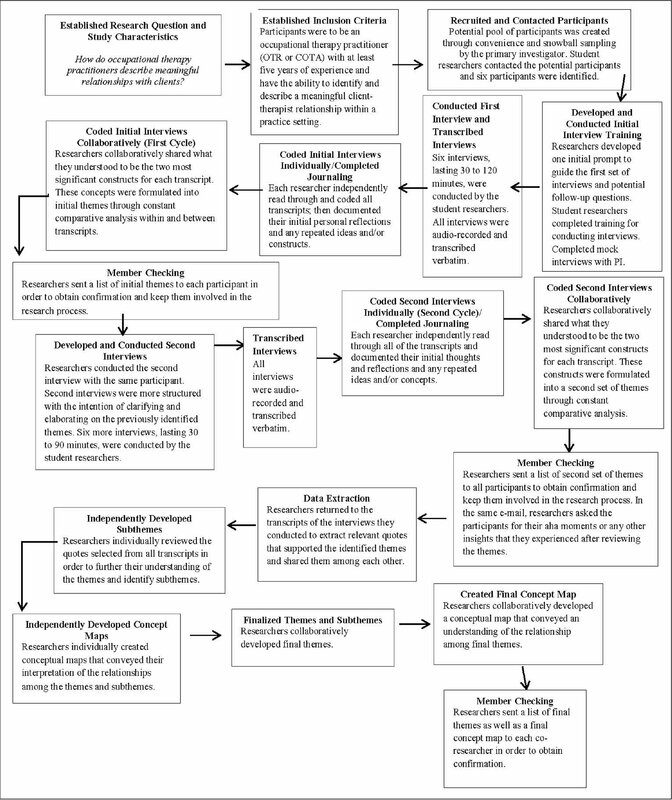 The summative flow chart describes the research process (Figure). Methods flowchart. COTA = certified occupational therapy assistant; OTR = occupational therapist registered; PI = principal investigator. Before the start of the study, approval was obtained from the institutional review board at Elizabethtown College. Before the interviews were conducted, informed consent was obtained from each participant. No conflict of interest was declared. Confidentiality was maintained, and no identifying information, such as state of residence and employer, was revealed to protect participants' identities. At the time of the study, the primary investigator was a licensed occupational therapist with 30 years of experience as well as 7 years of experience as a certified occupational therapy assistant. The primary investigator has completed multiple phenomenological studies over the past decade. Along with the primary investigator, the researchers included six occupational therapy graduate student researchers who had successfully completed applicable research coursework and one level II fieldwork experience in a physical rehabilitation or mental health practice setting. Before the start of the project, all of the researchers shared personal narratives about their own meaningful therapeutic relationships. The intent was to begin the process of listening to others' narratives (Brinkmann & Kvale, 2015), explore personal responses to the topic (Creswell, 2013), and introduce empathy into the listening process (Luft & Overgaard, 2012). The researchers wondered whether other practitioners had experienced and could articulate meaningful therapeutic relationships and describe how these experiences affected them as well as whether this phenomenon could be better elucidated. Potential study participants were identified through convenience and snowball sampling by the primary investigator. The participants either were known to the primary investigator and had previously shared narratives about client-practitioner relationships that held great personal meaning or were referred to the primary investigator because of expressed interest in the study. All study participants were occupational therapy practitioners with at least 5 years of experience who could identify and articulate a meaningful client-practitioner relationship within any practice setting. Six female licensed occupational therapists were recruited to participate in this study. 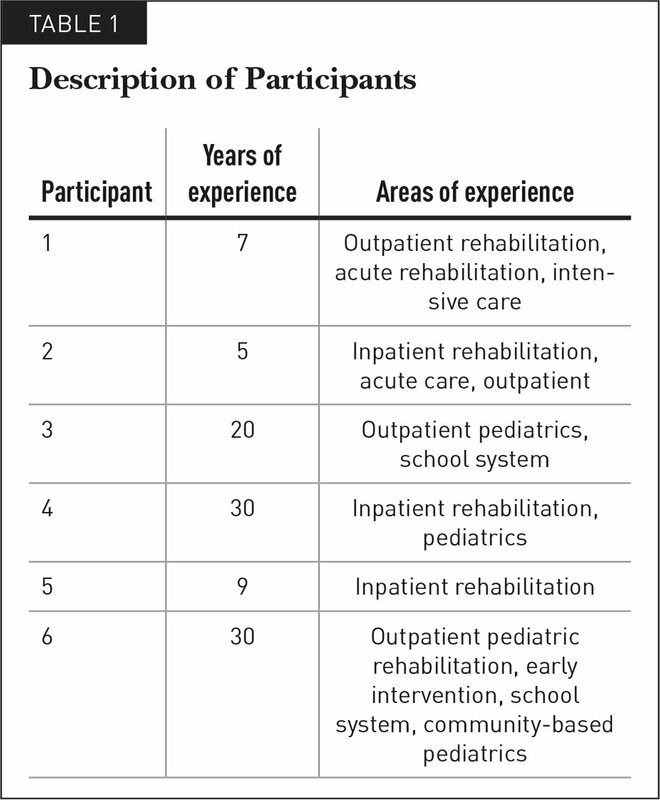 Their clinical experience ranged from 5 to 30 years, and their respective practice areas were variable but primarily included pediatric and/or physical rehabilitation (Table 1). Data were collected through two in-depth telephone interviews, conducted either through Skype or in person, at the convenience of the researchers and participants, as well as through e-mail communication. Each occupational therapy graduate student researcher was randomly assigned to a participant, and all communication, including the completion of both interviews, was conducted within these assigned dyads. The approach was used to promote trust between researchers and participants over time and with multiple in-depth interviews and interactions (Brinkmann & Kvale, 2015), to enable greater intersubjectivity and presence during the interviews (Luft & Overgaard, 2012), and to provide multiple opportunities for self-reflection and collaboration with participants within a focused designated time frame (Anderson & Braud, 2011; Creswell, 2013). Before they conducted the interviews, the graduate student researchers completed various listening activities and mock interviews with the primary investigator and within their own self-identified community of learning (Brinkmann & Kvale, 2015). Tell me how you understand emotional attachment and detachment with clients. When do you do each, why, and how? With many of the participants, we could see that they had certain things in common with clients (e.g., culture, age, gender). Can you think of another powerful or meaningful story in which you did not have things in common with a client? Were you still able to connect? Is having similarities something you consider helpful in forming a connection? We noticed many of the stories that participants shared involved forming a relationship over a long period of time. Have you had any meaningful experiences that developed over a shorter period of time with a client? We want to understand the transformation of the therapist. We would like you to think about four other clients or families that come to mind (can be past or present). Consider what you learned through your experiences with those clients or families. All interviews were audio-recorded and transcribed verbatim. After completion of the second cycle of coding, the researchers posed another prompt to the participants via e-mail to encourage them to further elaborate on their insights relative to the themes of the study. After the initial interviews were completed and transcribed, the researchers participated in the first cycle of coding, which included structured and descriptive coding of the topic and content, affective coding of emotions and values, and exploratory, holistic thematic coding (Saldana, 2009). After the second interviews, the second cycle of coding was completed and consisted of pattern coding and focused coding to highlight preliminary but salient ideas (Saldana, 2009). For both cycles of coding, constant comparative analysis was used to identify common themes that emerged within and between all transcripts. The researchers used a variety of approaches to promote credibility in data collection and analysis (Carter, Lubinsky, & Domholdt, 2011). All interviews were audio-recorded and transcribed verbatim to ensure accurate records of participants' responses. All of the transcripts were first coded individually by each of the researchers. The initial themes were then shared and discussed collaboratively; only the themes evident to the entire research team were used for continued analysis. The researchers also used journaling as a tool to reflect on their insights and actively engage in the research (Creswell, 2013). Member checking also was used to confirm the identified themes before they were finalized. Only themes that were agreed on by all researchers were reported in the final results (Creswell, 2013). The findings showed four overarching themes that describe the elements of a meaningful therapeutic relationship as perceived by the occupational therapists. The themes include entering into the client's world, forming a connection, maintaining equilibrium, and finding meaning. These themes were supported by participants' narratives of meaningful therapeutic relationships and by the follow-up interviews. Entering into the client's world occurs when the occupational therapist honors the client and the client's experiences. It is a mind-set or attitude that the therapist brings to the therapy process. This was evident when therapists acknowledged clients' experiences, changed approaches to meet clients' needs, or were just present in the moment with clients (Table 2). When participants acknowledged clients' experiences, they often expressed empathy and validated clients' realities. Participant 2 noted, “If you don't meet their emotional needs and acknowledge them and respond to them, I don't think we would be able to get anywhere physically. You need to be emotionally there.” Often participants changed their approach as they came to understand each client's unique personality and needs. Participant 2 also shared, “You almost have to be an actress in the sense that you don't change who you are, but you change who you are based on what people need.” Being present in the moment also allowed participants to enter into the client's world by fully committing themselves to the here and now as they engaged clients in the therapy process. Connections with clients may occur instantly because of similarities between the practitioner and the client or may develop over time based on their shared investment in the therapeutic process. Participants also discussed “tipping points,” times when a breakthrough occurred in the relationship that strengthened the connection between client and therapist (Table 2). It's almost like when you meet somebody, like a new friend, you're interested in their life. You get excited 'cause you like the person. You're so moved by the person or inspired by the person. You want to know everything about them. According to the participants, the duration of the therapeutic relationship had the potential to strengthen the connection between practitioners and clients and allowed practitioners to begin to understand “how and why they got to where they are and what brought them here” (Participant 4). The time spent together allowed participants the opportunity to deepen their knowledge of clients. Although participants noted that spending more time with a client was helpful in forming a connection, they also shared stories about meaningful connections that formed quickly, within days or even hours, when the therapeutic activities were intense, such as during personal activities of daily living and within the context of end-of-life care. What I learned from that relationship was that even though I'm sort of, I guess, the ‘expert,’ the occupational therapist, [and I know] the function of her arm and [activities of daily living], I'm not the expert on her life. You can tell you're becoming a little bit more emotionally attached when you feel your emotions change with the client. You want to keep reaching out to them to help them in some way. Like they're almost . . . I wouldn't want to say ‘friends’; that's overstepping a boundary. I think sometimes you have to realize that it can cross a boundary when they, maybe, are depending too much on you. Based on the narratives shared by the participants, occupational therapists may experience both professional and personal growth as well as transformation through meaningful client relationships. These changes helped to guide practitioners through current and future relationships with clients. The narratives suggested that occupational therapists may gain new insights that enable them to grow as professionals, and some participants shared how these relationships challenged previous biases they had toward individuals with specific diagnoses or personal characteristics (Table 2). Some components of entering into the client's world that were described by the participants are noted elsewhere in the literature. Showing empathy (Peloquin, 2003), honoring clients' subjective experiences and life stories (Romanoff & Thompson, 2006), and being present for clients (Crepeau & Garren, 2011) can facilitate formation of the therapeutic relationship. Additionally, the results of this study point to a dynamic approach, a willingness of the therapist to actively change roles and approaches to better enter into the client's world. According to the participants' descriptions of these relationships, the intention behind therapists' flexibility in changing personal approaches was not to facilitate a particular therapeutic response but instead to understand clients more fully and develop connections with them. The participants referred to the relationships they had formed with clients as developing along a continuum that ranged from natural to effortful. Although the literature describes intentional and sometimes effortful relationships with clients (Palmadottir, 2006; Romanoff & Thompson, 2006; Taylor, 2008), less information is available on those that form automatically. Palmadottir (2006) briefly described client-practitioner interactions that feel natural or occur easily. Although few studies have reported on this topic, all participants shared at least one experience in which a meaningful relationship with a client formed naturally as a result of having characteristics in common (e.g., age, nationality, interests). Although many participants mentioned commonalities with clients as helpful, they were still able to form powerful connections in the absence of those similarities and even in cases when there was tension in the relationship. Participants understood shared investment as commitment to the therapeutic process by both the client and the practitioner as well as recognition of the potential for growth toward therapeutic goals. All of the participants shared experiences of disconnect with clients. The disconnect was sometimes followed by tipping points, when a new connection was made and a breakthrough occurred in the relationship or therapeutic process. Darragh et al. (2001) validated that practitioners can damage the therapeutic relationship if they disregard the client and are unwilling to listen. Although Darragh et al. (2001) alluded to the idea of tipping points, there is limited explanation of this phenomenon in the literature. According to participants' narratives and later interviews, clear demarcations can occur within the relationship when something shifts and the practitioner has an insight or an aha moment that moves the therapeutic relationship to another level. The participants recognized that both clients and therapists bring vulnerabilities, emotional needs, and shared humanity to the therapeutic relationship. Many participants shared stories of personal tension that occurred as they were challenged, at times, to maintain balance between professional roles and their own and their clients' emotional needs. According to Taylor (2008), occupational therapy practitioners must recognize their own emotional responses to clients, cope with these responses, and act appropriately to maintain the therapeutic relationship. Our study highlights Taylor's (2008) findings as the participants acknowledged their internal responses to clients and expressed their attempts to cope with these responses through dialogue with other practitioners, self-talk and personal reflection, and engagement in stress-reducing activities outside the work environment. Although participants acted to preserve these relationships during challenging times, they also acted intentionally to maintain their own emotional well-being and further clients' successes. This study showed different means by which practitioners acted to meet clients' emotional needs and attend to their own emotional well-being. These included distancing themselves and reinforcing boundaries. Finally, the participants expressed gratitude for the benefits that they received through these personally identified meaningful relationships. Participants described therapeutic relationships that led to personal and professional growth and even deep transformation. The participants described the benefits of these relationships, which included learning how to individualize treatment based on client factors, improving clinical decision-making skills, learning personal “life skills” through the experience, and being “forever changed.” Participants acknowledged that meaningful therapeutic relationships can provide practitioners with something more than witnessing client success and achieving therapeutic goals. These relationships also may enrich the therapist's personal and professional life journey. The most recent version of the Occupational Therapy Practice Framework recognizes therapeutic use of self as part of the occupational therapy process (American Occupational Therapy Association, 2014). This is an expansion of the second edition of the Occupational Therapy Practice Framework, in which therapeutic use of self was represented simply as applicable to providing interventions (American Occupational Therapy Association, 2008). This change emphasizes that therapeutic use of self is integral to the entire therapeutic process and that it can be employed in all interactions with clients (American Occupational Therapy Association, 2014). In light of this increased focus, practitioners must understand the implementation of this practice more comprehensively. Regardless of the intervention context, practitioners are expected to form and maintain therapeutic relationships with clients. This pilot study adds to our current understanding that therapeutic relationships also may have significant benefit for occupational therapy practitioners. Although there is conceptual knowledge of the therapeutic use of self, literature on reciprocal therapeutic relationships is limited. Many aspects of this type of relationship are not fully understood. In our pilot study, many participants described meaningful relationships that occurred earlier in their careers. Even participants who had 20 or more years of experience explicitly noted powerful incidents that occurred when they were still novice practitioners and provided rich details about those interactions. The question, then, is whether practitioners tend to have more of these relationships earlier in their careers. Taylor et al. (2009) noted that younger practitioners were more likely than older practitioners to experience concern for clients. Is it possible that practitioners are more open to these experiences in the early stages of learning and thus find more meaning in them? More research is needed to better understand how such experiences affect practitioners' evolving professional lives. This study brought to light practitioners' perspectives on the therapeutic relationship; however, more research is needed to understand how clients describe their experiences of meaningful relationships with occupational therapy practitioners. Do clients view these same relationships as powerful, or is this something experienced only by the practitioner? If clients do find these relationships powerful or meaningful, how do they describe these experiences? Lastly, a goal of the study was to elucidate occupational therapists' meaningful therapeutic relationships within any practice context. We did not interview any practitioners working within a mental health practice setting, and we did not further clarify the implications of the social, political, cultural, and temporal contexts on meaningful therapeutic relationships. Additional study to include more varied participants and contexts is needed. Participants were chosen through convenience sampling by the primary investigator, and bias may have been introduced through the use of this method. A phenomenological methodological approach urges a lack of structure to the design (Flood, 2010), and the use of a semistructured interview format as well as the use of multiple and novice researchers may have led to inconsistent approaches to interviews and data collection. This study describes occupational therapists' reflections on meaningful relationships with clients. The findings include aspects of the therapeutic relationship that have not been reported previously. The results of this pilot study also show how meaningful therapeutic relationships may affect practitioners' personal and professional lives. More research is needed to fully understand how these complex and dynamic relationships between clients and practitioners develop throughout the therapeutic process and how they affect practitioners' clinical reasoning, long-term professional identity, and career development over various professional and personal contexts. Anderson, R. & Braud, W. (2011). Transforming self and others through research. Albany, NY: State University of New York Press. Brinkmann, S. & Kvale, S. (2015). InterViews: Learning the craft of qualitative research interviewing (3rd ed.). Thousand Oaks, CA: Sage. Carter, R., Lubinsky, J. & Domholdt, E. (2011). Synthesizing bodies of evidence. In Rehabilitation research: Principles and applications (4th ed., pp. 359–370). St. Louis, MO: Elsevier Saunders. Creswell, J. W. (2013). Qualitative inquiry & research design: Choosing among five approaches (3rd ed.). Thousand Oaks, CA: Sage. Frank, J. D. (1958). The therapeutic use of self. American Journal of Occupational Therapy, 12(4, Pt. 2), 215–225. Luft, S. & Overgaard, S (Eds.). (2012). The Routledge companion to phenomenology. New York, NY: Routledge. Mattingly, C. (2000). Emergent narratives. In Mattingly, C. & Garro, L. C. (Eds. ), Narrative and the cultural construction of illness and healing (pp. 181–211). Berkeley, CA: University of California Press. Peloquin, S. M. (2003). The therapeutic relationship: Manifestations and challenges in occupational therapy. In Crepeau, E. B., Cohn, E. S. & Boyt Schell, B. A. (Eds. ), Willard & Spackman's occupational therapy (10th ed., pp. 157–170). Philadelphia, PA: Lippincott Williams & Wilkins. Schwartzberg, S. L. (1988). Generic tools. In Hopkins, H. H. & Smith, H. D. (Eds. ), Willard and Spackman's occupational therapy (7th ed., pp. 385–389). Philadelphia, PA: J. B. Lippincott. Taylor, R. R. (2008). The intentional relationship: Occupational therapy and use of self. Philadelphia, PA: F. A. Davis. Taylor, R. R. & Van Puymbroeck, L. (2013). Therapeutic use of self: Applying the intentional relationship model in group therapy. In O'Brien, J. C. & Solomon, J. W. (Eds. ), Occupational analysis and group process (pp. 36–52). St. Louis, MO: Elsevier. Tickle-Degnen, L. (2008). Therapeutic rapport. In Radomski, M. V. & Trombly Latham, C. A. (Eds. ), Occupational therapy for physical dysfunction (6th ed., pp. 403–419). Philadelphia, PA: Lippincott Williams & Wilkins. Walker, A. D. (1971). Occupational therapy in geriatrics. In Willard, H. S. & Spackman, C. S. (Eds. ), Occupational therapy (4th ed., pp. 507–539). Philadelphia, PA: Lippincott. Dr. Humbert is Associate Professor, Elizabethtown College, Elizabethtown, Pennsylvania. Ms. Anderson is Occupational Therapist, Peace Corps, Kwanta, Ghana. Ms. Beittel is Occupational Therapist, Mennonite Home Communities, Lancaster, Pennsylvania. Ms. Costa is Occupational Therapist, French River Education Center, Oxford, Massachusetts. Ms. Mitchell is Staff Occupational Therapist and Clinical Research Therapist, MedStar National Rehabilitation Hospital, Washington, DC. Ms. Schilthuis is Occupational Therapist, Reston Hospital Center, Reston, Virginia. Ms. Williams is Occupational Therapist, Franciscan Children's, Boston, Massachusetts. Address correspondence to Tamera Keiter Humbert, DEd, OTR/L, Associate Professor, Elizabethtown College, One Alpha Drive, Elizabethtown, PA 17022; e-mail: humbertt@etown.edu.